This Week In Time Capsules: Would You Eat 65-Year-Old Capsule Cake? This week's round-up of the hottest in time capsule news includes discreetly hidden invitations for any real-life time travelers, memories from the 2011 earthquake in Christchurch, and a slice of cake found in a time capsule from 1948. 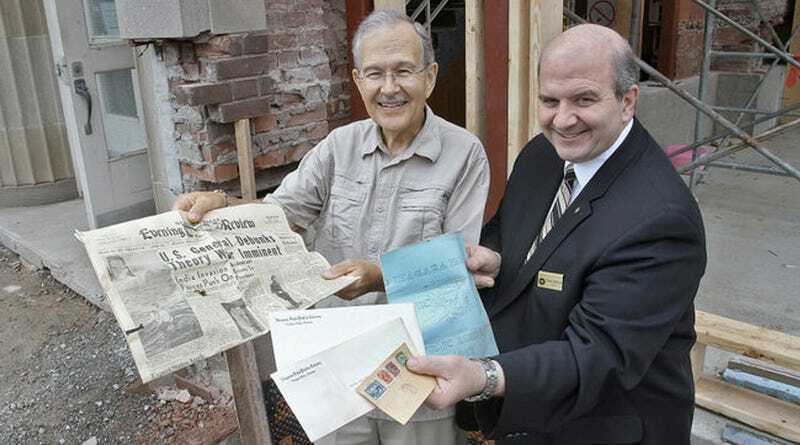 Funeral home owners on the Canadian side of Niagara Falls were making renovations on their building recently when construction crews discovered a time capsule from 1948 hidden inside the cornerstone. The capsule included various staples of 20th century capsuling, including newspapers, typewritten letters and some postcards. But one item seemed a bit peculiar to the group. According to the Niagara Falls Review, the building owners were surprised to find a piece of cake wrapped in wax paper. One of the owners speculated that it must have been part of the original reception for when the building opened in the late 1940s. The owners of a frame and mirror shop in Christchurch, New Zealand placed a time capsule in the foundation of their new building this week. Since the 2011 earthquake in Christchurch that killed 185 people, the city has been going through a process of reconstruction both physical and emotional. The owners of the shop hope that their time capsule will give people of the future an idea of what life was like in the years following the quake. The time capsule includes an iPhone case, but sadly no iPhone. "No one wanted to put an actual iPhone in there," one of the shop owners told the local press. As every capsule enthusiast knows, one of the most difficult questions you face when burying any time capsule is anticipating what kind of technology might be available when you open it. I've been on this earth for less than three decades and in that time humanity has gone from floppy disks and cassette tapes to smartphones and HD video that effortlessly dashes through the ether. Officials in Hilton Head, South Carolina are currently working through that issue and will have to wait until the year 2033 to see how well they did. They're looking for digital submissions to a new time capsule that will be opened in just 20 years. The submissions will be included on SD cards and officials have been sure to note that they'll include SD card readers in the time capsule.